You may know Google's Instant Search in Chrome, it's a new search enhancement that shows results as you type, it helps you get better search results, faster. 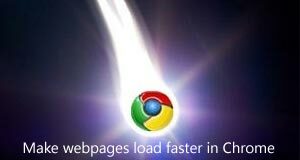 However, do you know that Instant Search feature in Chrome is powered by Chrome's prerendering technology? When a website is confident about predicting what link you might click next, the site can tell Google Chrome to pre-load, or "prerender" the links, so the page loads instantly when you click it. For example, when you're browsing a blog, you might click "next post" when you’re done reading. The blog can tell Google Chrome to pre-load the "next post", so the page shows instantly when you click it. 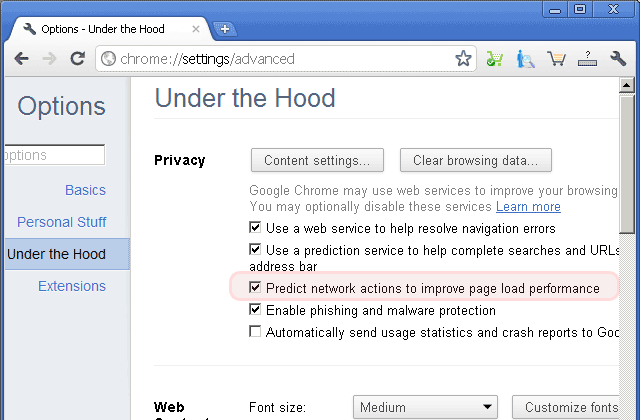 Click the wrench icon on the Chrome toolbar. Click Options (Preferences in Mac and Linux) -> Under the Hood. In the "Privacy" section, use the "Predict network actions to improve page load performance" checkbox to enable or disable the feature. Prerendering is an experimental feature in Chrome (versions 13 and up) that can take hints from a site's author to speed up the browsing experience of users. A site author(webmaster) includes an element in HTML that instructs Chrome to fetch and render an additional page in advance of the user actually clicking on it. As a web developer, you may be interested in triggering prerendering or, much more likely, in detecting when your site is being prerendered. To enable prerendering for your website, click Web Developer's Guide.